Topre is a brand that occupies a rather special place in the mechanical keyboard community. While not technically considered a mechanical keyboard, many enthusiasts do seem particularly fond of the company’s mechanism as it provides a very unique typing experience that can’t seem to be mimicked no matter how hard switch makers seem to be trying. While Topre’s switches might probably be best known for being used in the Happy Hacking Keyboard, the Realforce lineup of keyboards are by Topre themselves and is currently officially distributed by Fujitsu Computer Products of America. There are some who consider the Realforce keyboards to be their “end game” in terms of a hobby, and this review will attempt to find out if the Realforce justifies such a sentiment, as well as what we liked and didn’t like about it. At first glance, the Realforce keyboard doesn’t really have much going for it in terms of design. It looks like the standard full-sized keyboard that you might expect to see from school or office computers. The model that was sent to me for review is the black version, which admittedly is rather stealthy given the black on black keys and legends, but maybe a bit too stealthy to the point where it’s a bit hard to see. The lack of backlighting makes it even harder to see in low-light situations, so if you think that this might be an issue for you, you might want to consider the version of the keyboard that is offered in an ivory finish. The keyboard itself is pretty hefty and weighs about 1.4 kg. It feels very sturdy and there is almost zero flex. It is also mostly made out of plastic which isn’t a bad thing as we imagine that incorporating metal into such a big keyboard could make it a lot heavier. The keys are made of PBT and uses the dye-sub process for its legends, ensuring that it won’t fade over time. The cable attached to the keyboard is not removable so it might make it a bit more tricky to bring around or replace in the event that it is spoilt. Under the keyboard, there are cable routing channels that should help with cable management, adjustable feet, and also four rubber grips located near to the corners of the keyboard to help prevent the keyboard from sliding around, although given its weight it is pretty stable. The Topre switches are the main reason why anyone would want to consider getting the Realforce. Unlike more traditional mechanical switches you see being offered by other companies, Topre’s switches function in a very different way as you can see in the diagram above. As a result of this design, it blends the tactility you might expect from a mechanical keyboard switch, but at the same time, the use of the rubber dome results in a softer and quieter press. One could almost call it a “rounded” experience, versus the sharp tactility that some other switches like the Cherry MX Blues offer. If you’re coming from a Cherry MX style keyboard, the closest thing we would say it compares to would be Cherry MX Brown switches. There is also the much coveted “thock” sound with each keystroke, something many a switch maker has tried to emulate albeit not that successfully. This would make the keyboard ideal in a working environment where more clicky switches would drive your co-workers mad. This particular Realforce model also uses variable weights in its switches, meaning that the different keys have different weights, as you can see in the image above that shows how they are distributed. This means that for the alphas, they are generally lighter between 35g and 45g, making it lighter to the touch. Whether or not you’ll notice the differences depends on how heavy you type. Realforce also claims that the keyboard has a feature called the Actuation Point Changer, meaning that you can change the distance the key needs to travel before it is registered with the computer. In theory, this means that a light actuation point would make it ideal for gamers who might require quick input, while a heavier actuation point might be better for typing. Customization for the Realforce is, unfortunately, a bit limited. There is software for the keyboard which can be downloaded from the Realforce website. From there, users can lock certain keys, such as the Windows key, during gaming. They can also swap the Control key with the Caps Lock key if you prefer a pseudo-HHKB layout, and also change the LED indicator colors, but that’s pretty much it. While the keyboard itself cannot be programmed via the Realforce software, there are shortcuts that have been pre-programmed into the keyboard. These are keyboard shortcuts that can help you launch certain apps, control media playback, and so on. However, these have all already been set which is unfortunate as we would have loved the ability to maybe create our own shortcuts, or at least customize the ones that are already available. Also due to the fact that the Realforce keyboard uses Topre switches, you will be extremely limited when it comes to custom keycaps. This is because the majority of custom keycaps are made for Cherry MX-style stems versus Topre stems, so while there are some options for customization, they are severely limited. So who is the Realforce aimed at? If you need a somewhat quiet, discreet-looking, full-sized keyboard, then this could be worth some consideration. However if you’re a gamer who requires additional macro keys or programmability, then maybe not so much. We admit that the $258 price tag is a bit of a hard sell especially for what appears to be such a “basic” keyboard, but as we said, the Topre switches and the experience of typing on them are the main highlights and selling point of the keyboard. 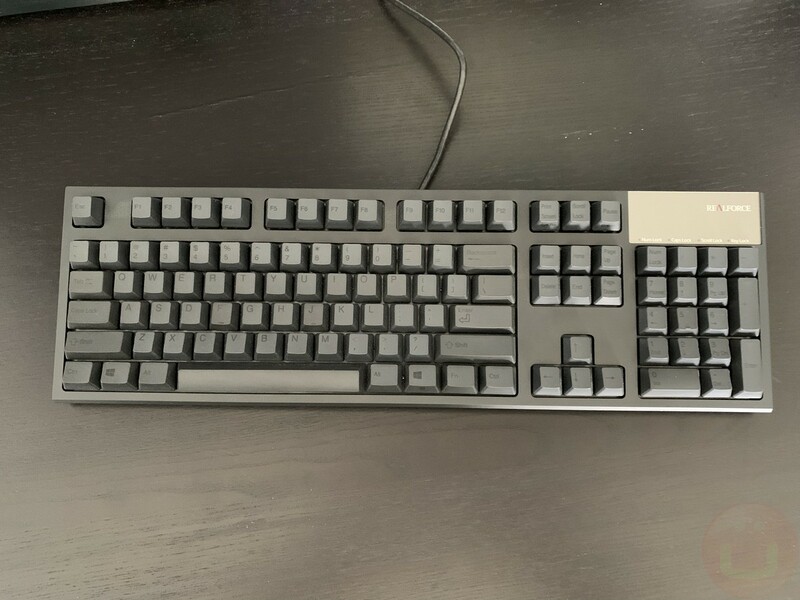 It is what some might call a trusty workhorse of a keyboard, where if you’re someone who spends hours on end typing out code or writing reports, then the smoothness of the Topre switch might make the Realforce keyboard a worthwhile investment. The Realforce R2S-USV-BK is available on Amazon if you are interested in getting your hands on it. Filed in Gadgets. Read more about Fujitsu and Keyboards.